It is not for nothing that Glasgow is sometimes referred to as the “Dear Green Place”. The word Glasgow in its Gaelic form actually means that. But for a city with a proud industrial heritage it sometimes surprises non Glaswegians and visitors to the city to find that it has more than 90 parks and formal gardens within its city boundaries. Ranging is size and use these parks include the sprawling and award winning Pollok Country park, home to the world famous and fabulous Burrell Collection, and even a couple of necropolis where it is possible to view the extravagant Victorian mode of burial writ large. All these green spaces are wonderful assets to the city but, like many public spaces, they can be forgotten, unloved and underused. But in the crowd economy where peer to peer connection and empowerment to act are providing us with the ability to re think how we own, manage and engage with public assets it is good to see a project like MyParkScotland emerge. MyParkScotland is the sole Scottish project of a scheme initiated by Nesta and the Heritage Lottery Fund called Rethinking Parks which is intended to encourage new ways of sustaining and making the most of public parks. What I like about the schemes is that it clearly understands the connection between awareness, engagement, validation, funding and sustainability which all good crowdfunding should. The other aspect I find particularly engaging is the modest size of some of the projects. If we accept that crowdfunding is founded in the principle that if we aggregate together many small sums we can achieve a great impact, so to can many small projects create a real difference. The project needed £500 to do this and it quickly raised its target in donations and the project to plant and enjoy the mini orchard will proceed. 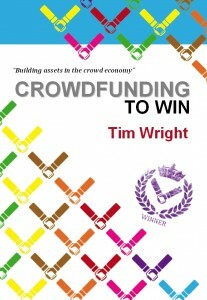 The modest size of the sum should in no way detract from its significance as it is in the very best traditions of crowdfunding. It offers a real mechanism for a community to take ownership of the challenge by reducing barriers to participation, raising awareness and embracing small contributions of time and money to directly engage with the development of a local shared asset. I hope this project is the first of many successful schemes which encourage a greater sense of civic engagement, and begin to show how crowd based activities and direct peer to peer action has the power to change how we own, value and define our world.